Gibson ES-335 DOT Custom Shop Edition Model Semi-Hollow Body Electric Guitar (1984), made in Nashville, TN, serial # 82914569, natural lacquer finish, laminated flame maple body, mahogany neck with rosewood fingerboard, black hard shell case. Overall length is 41 1/2 in. (105.4 cm. ), 16 1/16 in. (40.8 cm.) wide at lower bout, and 1 3/4 in. (4.4 cm.) in depth, measured at side of rim. Scale length is 24 3/4 in. (629 mm.). Width of nut is 1 11/16 in. (43 mm.). Relic, you say? These days there are a lot of guitars that are made pre-worn -- carefully sanded, dinged, and spattered to look like they've actually had a life. 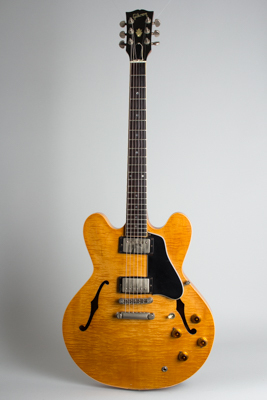 This beautiful ES-335 is *only* 35 years old but has been authentically "reliced" by some serious play, smoked and funked by someone gigging out, not with a hammer and sandpaper. It really has the feel of a much older guitar now. This is the fancier Custom Shop edition of the 1984 ES-335 Dot reissue, with nickel-plated hardware and spectacular curly maple on the top and back. The blonde finish-designated "ANT NAT" (Antique Natural) in the neck pickup cavity has mellowed to a beautiful honey maple color. The lacquer shows many small dings and dents, a patch of binding has been replaced along the bottom edge of the face, and a number of very small checks in the top layer of maple veneer have opened up. The nickel plating overall has some light corrosion; the only major wear there is to the original pickup covers, which show some fairly heavy scuffing and look like someone cleaned them repeatedly. The pickups appear to be Tim Shaw pickups. The neck pickup reads, 7.14 ohms. The Bridge pickup, 7.26 ohms and combined, 3.60. They are ink stamped on the bottom but difficult to read but looks like Neck, 137988 Bridge, 1380982. Difficult to read but the 137 is legible and you can make out the 38 on the bridge. The back of the neck has some worn spots down to the wood, but the dings are not deep enough to feel intrusive. The neck profile is reminiscent of the 1960 flatter 335 style than the deep and chunky '59s, but with a rounder back. The rosewood fingerboard shows a lot of wear, but the frets (which appear original) still have a decent crown to them and play well. Despite the obvious play time, this one appears all original except for a couple of screws. This is a great-sounding guitar that has really transcended its "reissue" status; it plays and sounds just like a 335 should, and is definitely "blues approved". Very Good + Condition.